Choosing the right diaper can be a daunting task for moms. Besides deciding on the brand you need to know if the cutting and material used in the diapers is suitable for your growing child. The diaper chosen has to meet the following criteria. I have been using various different brands of diapers with my three kids . 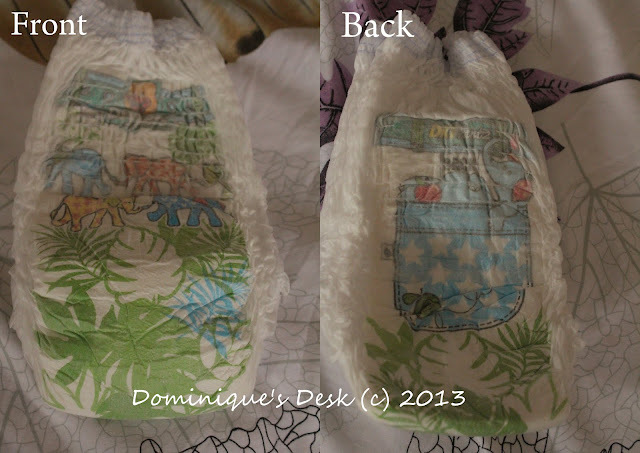 I had changed the types of diapers which each child needed to use based on their current needs. Diaper change shouldn’t be a troublesome affair and something that could be carried out effortlessly. It should be a moment of bonding where mother and child can interact with each other with no hassle at all. For the past few weeks Tiger girl has been on Drypers DryPantz as we have started toilet training with her. I figured out using diaper pants would be much easier to train her as she could put on and remove the diaper by herself when needed. Drypers DryPantz ( for babies 6 months and up) is noted for containing Activ-CoreTM which helps to quickly absorb urine and prevent flow-back to keep baby’s skin dry, healthy and extra comfortable. It also has Flexi-FitTM, a snug and soft waist elastic which helps to provide little ones with better mobility and a comfortable fit, so baby moves with greater ease. I certainly had to test out their claims and see if this was the diaper pants which would be suitable for Tiger girl to use. As you can see from the collage above there are two distinct designs on both side of the diaper. A group of elephants adorn the front while an elephant in a pocket with the word BACK defines the back of the diaper. These markings make it easy for Tiger girl to identify which side is the front and the back so she doesn’t put it on wrongly. The diaper feels soft and cottony to the touch and easily expands to fit Tiger girl when it is put on. It only takes a few minutes to remove or put on the diaper so that more time could be spend playing and reading with Tiger girl before she heads off to bed for the night. Kids grow up so fast and it is important to be with them during the first three years of their lives to be able to witness them meeting their milestones. It is very satisfying to be able to see your child learn the art of how to wear her own clothes and feed herself without any assistance. This life skill that she has learned will see her through the rest of her life. As you can see the Drypers DryPantz fits on rather snug on her. She is using XXL even though it is recommended for babies who are slightly heavier then her current 14kg. In fact I feel that the cutting is a bit to snug and she would be outgrowing their largest size very soon. Tiger girl could put on her diaper by herself without any assistance. It also kept her dry all through the night and there was no leaking of the diaper when she slept. Diaper changing was hassle free and we could spend more time on reading storybooks together before bedtime. We have been using Drypers DryPantz for the past month and here is our findings. 1. It comes on and off easily and even Tiger girl doesn’t have problem wearing it on her own. 2. It is very absorbent and go through a few sessions of wetting however it can get very uncomfortable if she poos in the diaper. Tiger girl will immediately ask for a change. 3. It is breathable and Tiger girl has not have any rashes or allergic reactions from using it. 4. It is affordable and comparable to the other premium diaper pants in the market. It’s certainly value for money. This diaper certainly does meet my expectation in what I am looking for in a diaper however the small cutting may make it unsuitable for babies which are more chubby. Drypers DryPantz cost $16.50 per pack and comes in various sizes. It is available at all major departmental stores and supermarkets. If you are interested in getting a sample for your child you can visit the Drypers FB page for more updates and parental tips. I used Drypers too when my son was a bit younger and when I haven’t fully switched to cloth diapers. I love their products and I love how soft the drypantz are. I could have continued buying the product if i hadn’t switched 🙂 good choice dominique.